Many months ago, this calendar was part of my online shopping list. I later found out from a (now former) co-worker that a store in Perth sold them. Originally, I wanted the orange/silver one, however Venn store never seemed to have them in stock when I was there. Then the other day, I received a call informing me they were back in stock! When I got to there, I saw the orange/silver one next to the red/black and all-silver ones. I had a tough decision to make. I really like orange, however the combination of red and black is always striking. I stood there staring at the two calendars for several minutes. I'm not even kidding. Getting back to the point... Sometimes, what you want isn't really what you want. Over time one's taste evolves. In the end, the reason I chose the red/black one was that it looks very Bauhaus and cool — not to mention it goes well with the other things in my cubicle. 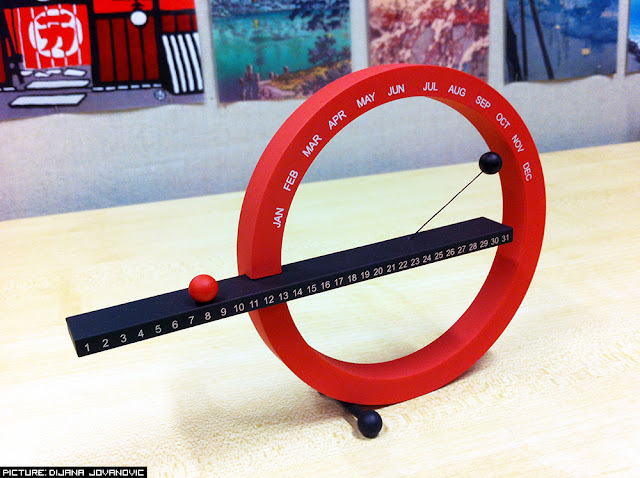 Also, the best thing about having a perpetual calendar is that I'll need to buy a desktop calendar ever again! I'll be doing a series of posts about Open House Perth. Get ready for my best pictures of Perth Arena and other notable buildings from Perth's skyline! After that, an awesome Photoshop Tutorial. How to photoshop one person's face onto another person's body. With all the special tips and tricks I use to make it look more realistic!